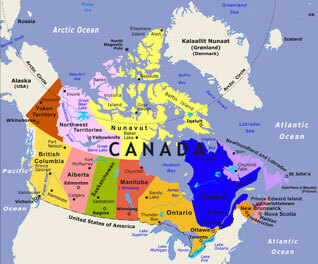 Canada is located in the Northern Hemisphere, on the continent of North America. It is bounded by the Arctic Ocean on the north, by the United States and the Great Lakes on the south, by the Atlantic Ocean on the east, and by the Pacific Ocean on the west. Canada is bounded on the northeast by Greenland and on the northwest by Alaska. Canada's area is 9,976,185 square kilometers (3,851,808 square miles). Canada is a federation of ten Provinces and three Territories. The four Maritime Provinces of New Brunswick, Newfoundland and Labrador, Nova Scotia, and Prince Edward Island are influenced by their relationships with the North Atlantic Ocean and the Gulf of Saint Lawrence. Quebec and Ontario are the most populous Provinces in Canada, while Manitoba, Saskatchewan, and Alberta occupy Canada's central prairie heartland. British Columbia, the westernmost Province in Canada, lies between the Rocky Mountains and the North Pacific Ocean. Canada's Territories, consisting of Nunavut, Yukon, and the Northwest Territories, lie to the far north. They have no inherent jurisdiction, and only exercise powers that are delegated to them by Canada's federal government. BBC News - Canada offers an excellent news and information profile of Canada. Map of Canada, featuring Canada's major cities, roads, lakes and rivers. Atlas of Canada features national and provincial maps of Canada. CIA World Factbook - Canada features a map and facts about Canada. Historical Maps of Canada features Canada maps dating back to 1700. Canada Relief Map shows the topographical features of Canada. Canada Maps features detailed Canadian province road maps. Canada's capital city is Ottawa, Ontario. Other major cities in Canada include Toronto, Montreal, Calgary and Vancouver. Popular Canadian travel destinations include Niagara Falls in the east and the Canadian Rockies in the west, as well as the coastal Maritime Provinces and historic Quebec City. The principal languages spoken in Canada are English and French. For additional Canadian travel and tourism information, visit Travel Canada, sponsored by the Canadian Tourism Commission. For information about Canada's National Parks, visit Parks Canada. For Canadian rail travel schedules, see VIA Rail Canada. Major Canadian airports include Ottawa International Airport in Ottawa, Montreal-Trudeau International Airport in Quebec, Toronto Pearson Airport in Ontario, Calgary International Airport in Alberta, and Vancouver International Airport in British Columbia. Canada News - News headlines and news article links about current events in the nation of Canada.